(P1) A new report says there is a “wave of micro crime” in Britain. Researchers were shocked by their findings. One researcher said three in every four people you see in the UK are hiding a criminal history. 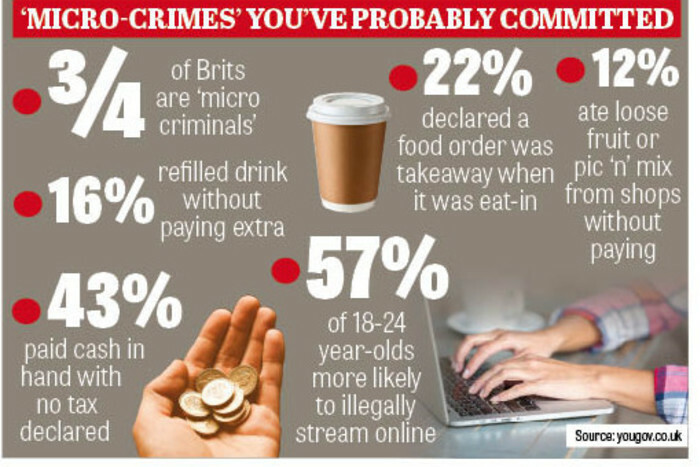 Up to 74 percent of British people are ‘micro-criminals’. They have done at least one minor, ‘micro’ crime.” The most common crime is paying someone cash when they know that person will not pay tax on it. (P2) Men were the most likely to commit micro crimes. About 80 percent of middle-class people and 70 percent of working-class people admitted to micro crimes. The second-most common micro crime was illegal downloading or streaming. About 30 percent of people did this. Other micro crimes include not paying for bags in supermarkets, lying about your age to get a better deal, and eating things in a supermarket without paying. Are micro-crimes committed in your country? If so, which ones? Why do you think so many people commit micro-crimes? Do you think people who commit micro-crimes should be punished if caught? Why or why not? What percent of British residents have committed a small crime? Which micro crime occurs more often than others? Excluding the most common micro crime, what are three other micro crimes?